Graduating from Sydney University, Dr Lee has over 20 years of experience. "Having worked as a manager of a large regional dental health clinic, and for years in the North Shore and beyond, I feel privileged to be part of Penshurst Dental where we offer excellent dentistry for our patients" To ensure precise treatment outcomes, Dr Lee uses German Carl Zeiss or Heine magnification during dental procedures. In his spare time he enjoys mentoring younger dentists, fishing, music and spending time with his family. “Welcome to our dental practice. Our plant and equipment are top of the range Italian, German and American units, and we have focused on the technical elements to enable accurate and excellent dental treatment”. To ensure convenience and accessibility, Dr Lee has launched an automated online booking system in October 2012. "We have always tried to make it easy for our customers to deal with us and we are happy to be perhaps the first practice in the region to offer automated online booking so our patients can book at their own convenience any day of the week, twenty four hours a day." Dr Truong is passionate about all things dental. Dr Truong is known for her gentle caring approach and emphasis on preventative care. Dr Nguy is ready to cater to your every dental need. Dr Nguy has special interests in creating beautiful restorations and creating the smile you deserve. Dr Yuen is our visiting surgical dentist, a recipient of the prestigious "Australian Professional of the Year" by the Australian Professionals Association. Dr Yuen has extensive real world experience in surgical and implant procedures, he provides Penshurst Dental with first-class implant surgical services. With over 40 years dental experience, Dr Yuen has personally placed over 2,000 implants and is a visiting surgeon to Adelaide Hospital. In his spare time Dr Yuen travels to East Timor for the volunteer East Timor dental project. Dr Yuen has provided implant services at our practice for over 10 years. An accounting and engineering graduate, Jamie is known for her service with a smile and is responsible for our practice management, bookings and ensuring the practice runs smoothly. Maria is well known by our patients for her friendly empathic manner and outstanding patient care. As well as great dental assisting, Maria will make you feel at ease, providing service with a genuine smile. Natasha has a diploma of dental technology and is coordinating clinical procedures and assisting. and ability to make our patients feel at ease. We accept new patients. Bookings available by phone anytime Monday to Saturday 9:30-6pm. 24 hour online booking click here. Free 3 hour council car parking in Connelly St (behind the surgery)with rear connecting walkways. We are conveniently located just a 3 minute walk from Penshurst Train Station. We are next to Penshurst RSL, behind Penshurst Australia Post. We offer HICAPS for fast claims on the spot from your health fund. Please note that whatever is not covered by the health fund must be paid for on the day. 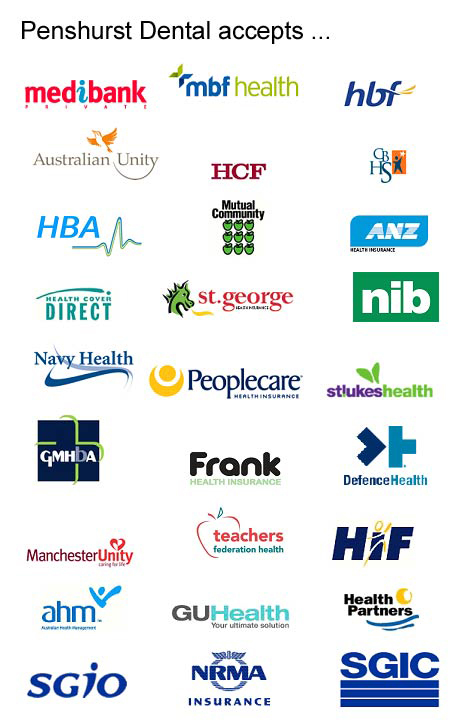 We accept all major credit cards and Eftpos, and are preferred providers for MBF, HBA, BUPA, Medibank Private, Veteran's Affairs and Southern Area Health Service.